I confess, I found myself a bit disappointed when I learned Christian Petzold’s new film, Phoenix, would be “about the Holocaust.” There is a certain weariness that arises out of the fact that so many use or have used the events of the Holocaust as a reference point, whether artistically, for a film’s central story (see Sophie’s Choice, Schindler’s List, The Pianist, among others) or socially, for a cheap point in a debate gone awry (see my Facebook feed). I wondered whether I was up for seeing yet another movie centering around the much-documented tragedy. But great artists work familiar things in such unfamiliar ways that even the cliché can take on unexpected, fresh resonance, and I see the familiar thing as I had not seen it before. It is both old and wholly new. Artists use myths, for example, in this way, and myths, in deft hands, never lose their power; Shakespeare would not be Shakespeare without his unashamed foraging through Ovid. Like myths, then, the Holocaust can be a powerful touchstone for describing our world. It can be a story that artists return to over and over, mining it for its significance, finding in it a means of plumbing the human soul, locating parallels with which to describe and understand the world. 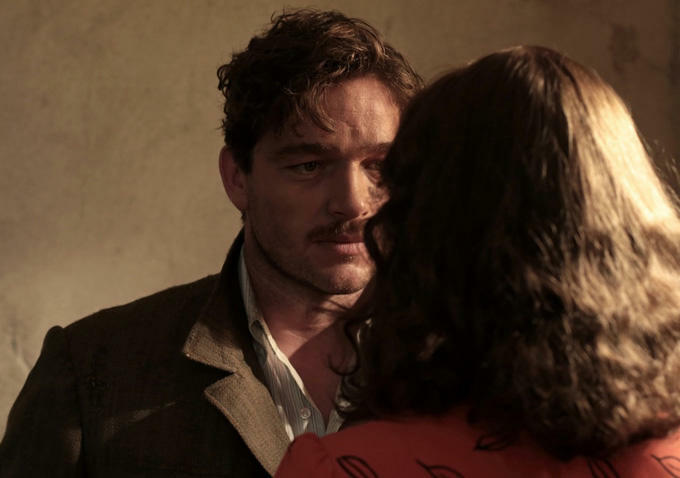 And it is with a delicate, deft artistry that Petzold, in Phoenix, not only tells a fresh Holocaust tale but weaves it together, with beautiful ease, with two myths: three old and familiar tales together becoming an astonishing, new thing. One of the myths he uses is, of course, indicated in the title: the myth of the phoenix – the bird who dies by fire and rises anew from the ashes of itself. It is a tale so resonant it has been referenced over and again, in varying times and cultures, often in religious or artistic contexts, to signify the mysteries of life and death, to describe the hope of immortality rising out of mortality. Sylvia Plath in “Lady Lazarus,” for example, re-imagines even the mortality of suicide as a kind of phoenix-like resurrection into immortality. The second myth, Greek in origin, is the Pygmalion myth, the tale of a sculptor, who, disgusted with the real women he sees around him, creates an ivory statue so full of womanly beauty that he falls in love with it; the goddess Aphrodite, giving him her favor, gives life to the statue, and the man marries his newly invigorated, perfect woman, now made living flesh. The Pygmalion myth also serves as a frequent reference for artists: it may be directly re-told – as in Bernard Shaw’s play – or it may be more elliptically explored, as in Hitchcock’s Vertigo, that tale of male, obsessive, destructive desire. Petzold’s use of the myths grasps their richness, but, like Plath, Shaw, and Hitchcock, fashions them afresh, adding new layers of resonance, both by way of the unusual juxtaposition between them and by way of their positioning within the particular Holocaust context of the film. The story is set in Germany, directly after World War II: the country is still filled with strangers – Allied soldiers speaking English – the landscape is a rubble, and survivors seek to find the lives and people they knew before the war, often finding those lives and people altered – some altered beyond recognition, some thoroughly destroyed, some apparently unchanged but bearing unacknowledged marks and scars. Within this context, the story centers on Nelly Lenz (Nina Hoss), a concentration camp survivor, whose face – a face we first see swathed, mummy-like, in bandages – needs surgical reconstruction after brutal injuries. “Make my face exactly as it was,” Nelly insists to the reluctant surgeon, who first suggests alternate recreations of her face that would more easily suit her injuries. A key tension of the film—finding a focal point in Nelly’s face and body—resides in the question of just how far a life—so completely disrupted by the destructive horror of war, particularly a war where the bodies of a very particular group of people have been so savagely marked for abuse and violence—might be restored or resurrected. Nelly hopes to find and reunite with her husband, Johnny (Ronald Zehrfeld), a non-Jewish man from whom she was separated when she was taken away, and restore their relationship. But when she encounters him early in the film, living a new life as a dishwasher in a sordid little post-war club, the Phoenix, she discovers that he does not recognize her. Or, rather, he recognizes in her the shadow of his wife, but does not see that she is his wife, and he proposes that she allow him to fashion her into something closer to the wife he remembers, using the re-creation of her body in order to claim Nelly’s family inheritance for himself. Her body in exchange for wealth. Johnny’s Pygmalion-like efforts—his use of Nelly’s body—reveal a parallel between Johnny and the Nazi government, perpetrators of the violence against Nelly’s body, and in the parallel we see that the wounds of the German nation are more than physical: they go soul-deep. It is not only the Nazis who are culpable; husbands, wives, families, friends are complicit, and the question becomes whether or not those kinds of complicities, those betrayals, might ever be healed. Family groupings, friend groupings–revealed to be so full of fissures–must be completely reassessed. 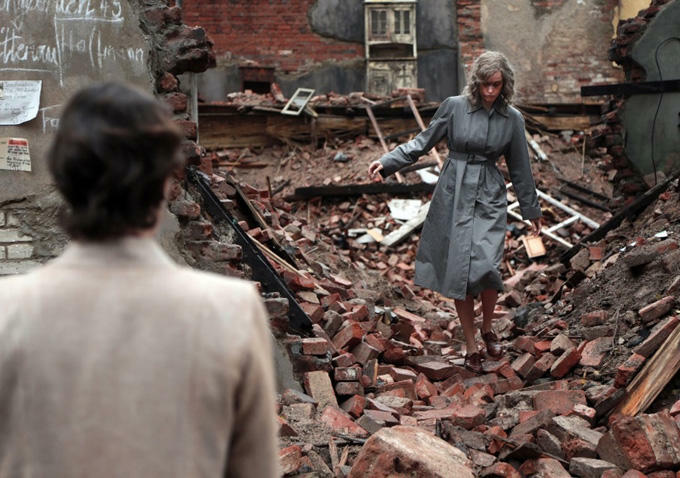 Nelly and Johnny’s damaged relationship, then, beautifully and slowly developed over the course of the film – and with masterful performances from Hoss and Zehrfeld – serves as a centerpiece for such reassessment, but Petzold also deftly uses the literal rubble of the war, papers and surviving photographic records, as potent visual metaphors for the rift in the national heart. A photograph, resting in Nelly’s hands, is a representation of death and betrayal: pre-war, photos were smiling groups of families and friends, innocent and unaware. Post-war, the survivors must catalogue the photos, calculating the damage of the war: some faces are circled (these are the Nazi informers), and some faces are marked with little crosses (these are the dead). The significance of the marks brings into sharp relief just how much things have changed: never again will the smiling group gather together, some individuals now destroyed in body, some now destroyed in soul. Nelly and Johnny are only two such marked individuals, and within their story lies a German story, a war story, a deeply human story, one that asks what remains when all—body and soul—is destroyed. Do the ashes bring forth a re-born bird? Can a man fashion ivory until it becomes living flesh? Is there a happily ever after? Petzold’s answer to those questions, as the film closes, is as complex and moving as any answer I could have hoped for from such an artist as he, and I believe his use of the resonance of myths and the familiarity of the Holocaust in this tale will, like the best art, carry a mythic weight of its own. I will not easily forget Nelly’s transforming face – or Johnny’s, as he looks at her, and then looks at her again. Phoenix is, in a way, its own phoenix, flaming up out of the ashes of old stories: these characters I know – they are Pygmalions, ivory statues, living flesh, ashy birds, fiery birds, Holocaust victims – but I see them anew, and it is like seeing them for the first time. Phoenix opens in Seattle on Friday, August 14 at SIFF Cinema Uptown and in Bellingham on Friday, September 4 at the Pickford Film Center.